We at Mangrove Action Project take a truly grassroots, bottom-up approach to mangrove conservation and restoration issues. Our approach involves and includes the voices of the global South, local communities, and their partner non-governmental organizations (NGOs). 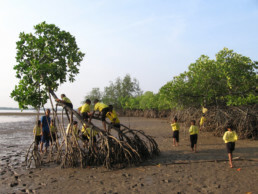 MAP works through action, advocacy, and education to ensure that mangrove forests are healthy for current generations – as well as those to come. Mangrove forests are simultaneously one of the world’s most important ecosystems – and one of its most threatened. From providing vital marine spawning grounds, to mitigating climate change (both through massive carbon sequestration potential, and in dealing with current effects like coastal erosion), maintaining biodiversity, and providing livelihoods to hundreds of millions around the world, mangroves are a vital resource for both local and global communities. Witnessing firsthand the rapid devastation of the world’s mangrove forest wetlands and their associated coastal ecosystems, the founders of the Mangrove Action Project decided in 1992 that it was time to form a global network to save the mangroves. From the beginning, we focused on problems affecting both coastal ecology and local communities. 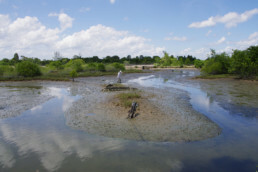 We became whistleblowers against the shrimp aquaculture industry, spotlighting its destructive expansion, responsible for hundreds of thousands of hectares of mangrove loss and ruin of valuable coastal zones. In recent years, MAP has transformed from a network- and advocacy-focused organization into one still involved in advocacy, but with programs and activities on the ground. We focus on viable, long-term, equitable solutions that place the local community at center stage. MAP supports the bottom-up approach in the search for more effective and lasting change.